What does a healthy life online look like? 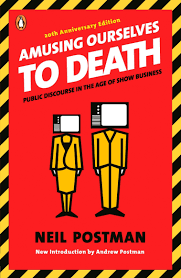 I finally read Neil Postman’s Amusing Ourselves to Deaththis summer. Published in 1985, the book argues the adverse effects of television. Postman, of course, was not alive to witness the advent of the smartphone, but I imagine he’d have even graver warnings for us today than in 30 years ago if he had been. Truthfully, I read Postman’s book at the cottage this summer, which means I didn’t take copious notes and copy them into Evernote, which tends to be my routine with books I am reading seriously. (Having borrowed the book from the library, neither did I do any underlining.) But that’s ok, because the book principally confirmed for me one of the most dangerous effects of our new media, which is this: as we increase our exposure to things beyond our sphere of influence, we increase our sense of impotence. Or let me say it this way: our capacity to know more comes with the ability to do less. In Postman’s day, we could watch the horror of the latest environmental disaster on the nightly news and apart from the check we’d write to the Red Cross, do little to substantially alleviate the suffering. In our day, we can browse Facebook and learn, as I did yesterday, that a young mother of three, diagnosed with Stage 4 breast cancer, lost her husband to a tragic hit and run accident. But apart from praying for this friend-of-a-friend (and I don’t mean to make that an insignificant means of participation), what can I really do to lighten the burden she must now carry? She is a faceless stranger, and my compassion for her, however sincere, cannot reach through the Ethernet and deliver the presencemost needed at times like these. Media gives me a greater glimpse of this groaning world. But as the world grows more and more broken, I feel less and less able to fix it. This is one danger of overexposure to media: it allows this sense of impotence to seep into the areas of my life where I can and should exercise personal responsibility. I may not be able to fix global poverty; I may not be able to physical comfort the woman suffering the sudden loss of her husband; but I can deliver a meal to the neighbor across the street who has just had triple bypass surgery. But will I? Will I think it significant enough? I have responsibilities to carry, and media is no reliable guide to what those responsibilities are. I am, of course, touching on only one of the many liabilities of too much digital engagement. There are certainly others, especially when we speak of social media: that it’s a distraction from deep work; that it’s a breeding ground for comparison and envy; that it’s hostile to charitable conversation. These are dangers, too, and I’m just as vulnerable as anyone else to the kind of addictive social media checking that makes me a passive participant in a world other than my real one. And yet,as a friend reminded me: good things happen on the internet, too. Interesting, even life-changing ideas are shared; real friendships are formed; awareness beyond our insular worlds is increased. No, I’m not suggesting we abandon all things digital and return to a safer, better world of the past (although I do remember my first summers as a high school teacher and the long stretch of days, without internet, that could be spent quietly reading books without interruption). What I am suggesting is a mindful approach to media, one that reflects intentionality and the wisdom of God, which seeks the “beneficial” and the “helpful,” not just the “lawful” (cf. 1 Cor. 6:12). So, I need your help. Yes, you out there in this big digital world of ours. What are the “rules” or “principles” you follow to cultivate a healthy life online? What digital “restrictions” help you to be present to your embodied, emplaced life? What do you choose to engage online, and what do you choose to avoid? Get practical for me: tell me how you use your smartphone, your desktop, how you create space for the work God’s calling you to do while also engaging online. Tell me what books and articles you’re reading that are helping you think through these important questions. Share online, or share in the comments below. I’m the student; you’re the teacher. Thanks for your input. I'll be curating responses, praying, and hopefully in the weeks to come, posting a guide to how I intend to more meaningfully engage online.